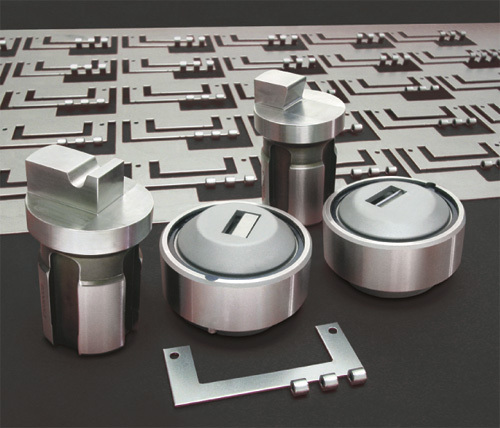 Mate Precision Tooling, Anoka, MN, now can form several different types, lengths and diameters of hinges for a variety of applications using Mate Hinge Tooling. Use the tooling to form hinges from mild steel, aluminum and stainless steel in thicknesses ranging from 0.030 to 0.060 in., incorporating pin diameters from 0.062 to 0.188 in. • Hit one with Tool 1 produces the radius at the end of the knuckle. • Hit two with Tool 1 produces the radius at the beginning of the knuckle. • Hit three with Tool 2 curls the form to complete the knuckle. Available in all tooling styles and station sizes, Mate Hinge Tooling is made from high-speed tool steel.